Letter from an agent: "We will never stop until we return Julen to his parents"
There are hours, hours for this Hunosa Mining Rescue Brigade to finally access the tunnel to manually excavate the last 4 meters until reaching Julen, the two-year-old boy who fell into a well near Totalán ( Málaga ) on last January 13. [This is the cornology of the case] . The tunneling operation of the vertical tunnel of 60 meters s depth drilled to rescue Julen when the tube that reaches the bottom is added a supplement of 12 meters . An operation that if no setback arises is expected to conclude early this Thursday. For this, the rescue teams continue working against the clock and without rest. Once the tunnel tubing has been completed, the land must be prepared , which would require about two or three hours and, from that moment, the phase in which the mining brigade would enter the tunnel would be activated, an operation for which they will count. with the support of the firefighters of the provincial consortium of Malaga . Two miners will descend through the tunnel - through a basket or capsule designed specifically for the rescue - with the intention of practicing with manual means a gallery of four meters in length that connects with the well where it is believed that the small one is. After about 30 or 35 minutes they would be relieved by two other miners who will keep biting and so on until the objective is achieved. In case they are hit with a stone of special hardness, specialists in microvoladuras could intervene to crack the rock. The firemen will provide logistical support related to ventilation and the safety of the operation . That is why in the area of ​​work in addition to the miners and firefighters, will be effective Civil Guard -among them mountain equipment-, the Emergency Health Company 061 and Emergency Coordination 112 Andalusia. The cladding operation will conclude fully when a tube of 12 meters is added to the tube that reaches the bottom. A new outpost that prevented to place the tube by which the miners will lower delayed again the operation in the well of Malaga . "The technicians, after detecting a protrusion in the last meters of the vertical tunnel and with the aim of accelerating the process, work directly on the tubing by reducing the diameter in the final section of the cylinder, which has to rest on the bottom of that vertical well" , explained Subdelegación de Gobierno to EL MUNDO. In this final phase, the rescue becomes a kind of relay race between several bodies and units: while the heavy machinery has so far dealt with the drilling and tubing of the vertical well parallel to the Julen well, the miners will be those in charge of manually digging horizontal access of four meters to the place where it is believed that the small one is, informs Efe. The thing advances, but slowly in Totalán 10 days later. The eight specialists of the Asturian rescue team, after staying early in the 'ground zero' of the rescue, have left the place in cars of the Civil Guard early in the afternoon, as there are still long hours for his intervention . "The best specialists in the country"
"There are the best specialists in our country" to perform jobs that are "difficult" , assured the president of the Provincial Fire Department of Malaga (CPB) and deputy, Francisco Delgado Bonilla. The deputy has also indicated that "everything has been planned" , always "guaranteeing security" and has indicated that the firefighters are prepared to help the Hunosa Mining Rescue Brigade. The provincial deputy has hoped that "throughout the day, this Wednesday, if there are no adversities" these specialists in mines, who arrived last week and who have already moved to the area as every morning , can begin this horizontal gallery , which would take about 24 hours. "We are prepared for when the time comes that concerns us, together with the miners who are the ones who have to do the work, provide them with all the necessary technical and logistical support , " he said. The delegate of the Government in Andalusia, Alfonso Rodríguez Gómez de Celis , has affirmed that work continues to rescue Julen "with the desire to arrive as quickly as possible". The representative of the Central Executive in the region has asked "to be aware that the well measures approximately the same as the Giralda de Sevilla" , so there has been "a quite important fall". In this regard, he commented that the work continues, after "reducing the burrs that were left when the tunnel was made", so that the tubes for the jacket can enter. All this, as he warned, "is done in an extreme and unprecedented situation, because there is no precedent in the world that can serve as a reference" , to which he has added "a third element" such as "sufficient delicacy not to harming the child more, beyond the damage that would have occurred in the fall. " Hunosa's former mining rescue brigade leader, to which the 8 miners belong who will have to excavate the last 4 meters to Julen, Santiago Suárez , has assured that he hopes that today they can start working on the excavation. This has also been confirmed by the Fire Brigade Consortium, which explained that everything is ready to start working before this afternoon. Suarez explained that the eight have to work as a team and give encouragement to each other, since the work that awaits them is quite complicated. They have to go down two at a time and they will have to work on their knees or lying down in shifts of between 40 minutes to an hour until they locate the child. As the miners move forward, they will support the roof and sides through the typical coal mining post system. "A piece is placed on the ceiling of the gallery and then propping up with wood," he explained. In the case that they find very hard rock, they will have to go to "microvoladuras" carried out with non-disruptive explosives. About 6.00 am on Wednesday, the driller has finished reprofiling the vertical well . After that, cleaning work has been undertaken on the inside of this tunnel and it has begun to be re-intubated. In the first hour, the operators of the rescue device have managed to introduce the tubes to secure the parallel well. That is to say, the jacket that this Tuesday delayed the rescue again. After all the night filing the walls of the parallel well, the pipes have been reintroduced to encamisarlo and perforate the missing meters . That is why the morning of Wednesday has been dedicated to eliminate these discontinuities with the machinery that made the first drilling, to then introduce the 42-meter jacket that was removed to finish then the remaining 18 meters to 60 meters that has the parallel tunnel, "plus 12 additional meters that are necessary for the performance of the rescue team" mining. The Government Delegation has made an appeal not to add "more pressure" to the professionals who are working on the rescue because they are already working "under hard enough pressure" on a task whose magnitude is "impressive". "It is the work of many men and women who impressively are 24 hours without rest to achieve the desire of all of us, which is to reach Julen as soon as possible and they do it with an exceptional team not only technical but also human", said Gómez de Celis, who pointed out that "everything that is needed is here in Totalán". Totalán is overturned with the rescue of Julen . The town of the child has become "a family", in the words of its mayor, Miguel Angel Escaño . The small town of Malaga with just 700 inhabitants has welcomed the parents of Julen and the rescue operation with all their hope. "I have done what had to be done and that's it," said the owner of the house where Julen's parents are staying, Ángela Alcaide , to Efe. Alcaide has indicated that she does not seek "any protagonism", but to offer herself "from the soul" to her and her husband, who have made available to the Julen family the "little" they have. "What we want is to end this nightmare," she said, who is "overwhelmed" and "very worried" while the news of the case on television from his home in the town of La Cala del Moral . The house, which Alcaide uses for his holidays, has "the conditions for this family to rest and not be overwhelmed," among which are bedding, "good blankets", bathroom, toilet, kitchen, three bedrooms, a dining room and other functionalities; In addition to having a location on the outskirts of the town that facilitates discretion and transport where they need. "They are there as if it were their house, as long as it takes ." While the rescue tasks continue, a court in Malaga investigates the circumstances in which the unfortunate incident occurred. The court of Instruction number 9 of Malaga, based on a report from the Service of Protection of Nature (Seprona) of the Civil Guard , has commissioned a series of actions after noting that both the well in which the child fell and the works that were carried out in the days before the accident -and that caused the stone that the pocero had placed on the hole to move- did not have the pertinent permits. The rescue of Julen has become complicated again. Hunosa's Mining Rescue Brigade troops were ready to intervene on Tuesday morning, but the vertical gallery has turned out to be too narrow for the tube that had to cover its walls. The problem, explains the deputy of the Provincial Fire Brigade of Malaga Francisco Delgado , is that the excavation does not leave the walls smooth. "With a 30-centimeter stone protruding, the tube does not fit", underlines EL MUNDO. Once this new work is completed, it will be the turn of this elite brigade, in charge of digging manually the tunnel that communicates horizontally with the well. Santiago Suárez , head of the Mining Rescue Brigade , explained in La Sexta that the greatest difficulty his men face is the hardness of the terrain, "uncharacteristically, strangely hard", so his manual intervention with the pneumatic hammer can require the use of microexplosives that "crack and soften the ground". Throughout the night work has been done without rest to finish the excavation of the parallel tunnel after the drilling of 60 meters of the gallery concluded on Monday. The operation has taken 55 hours to complete, at a speed of 1.1 meters per hour . 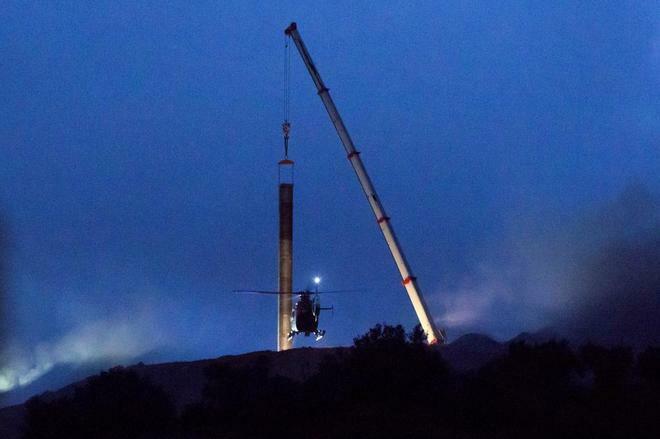 The rescue teams have completed the digging of the vertical tunnel parallel to the well that fell Julen 9 days ago, according to the deputy of the Provincial Fire Department of Malaga , Francisco Delgado, but new problems with the jacket of the tunnel could delay until Wednesday the rescue of the little one. They are looking for "immediate solutions"
The difficulties have arisen in the last sections of the vertical tunnel, when verifying that the tubes that were going to be used as a kind of rail (jacketed, in the jargon of the guild), do not fit in the existing drilling. According to device sources, "immediate solutions" are being analyzed. First, they must introduce a camera to check the tunnel's condition, while preventively they are looking for all the necessary means in case there is another problem to solve it quickly. Several options have been considered to redirect the situation and the safest option has been chosen: the well will be filled with fine earth and drilled again with a slightly greater thickening . The maneuver has already begun. Although it is not possible to give an estimate of time, it is estimated that the miners will take about 24 hours to dig the 4 meters to Julen once they start. But first the vertical drilling must be completed, which is expected to end this afternoon. Santiago Suárez , former head of the Hunosa Mining Rescue Brigade displaced to Totalán, explained that the 8-strong team that will be in charge of the last meters of the horizontal tunnel (4 meters) will have to work on their knees or lying down in shifts of between 40 minutes to an hour to locate the child . "They will work at a distance from the ground in order to leave it as a boiler to take away the rubble they are producing." When the gallery reaches one or two meters, they will move the cage upwards . The Government delegate expects "a happy ending"
The Government delegate in Andalusia, Alfonso Rodríguez Gómez de Celis, has indicated on Tuesday that he expects "a happy ending throughout today and tomorrow" in the rescue of Julen. This was stated during his speech at the opening of an informative breakfast held by La Voz de Almería , in which he expressed the "longing we have for everything to end well." The eight experts in mining rescue who will participate in the complicated tasks will do it in turns of two . The next phase is the gallery cladding works. Subsequently, the level of the mouth of the well that has just been executed will be re-established and the pit where the drilling machine was positioned will be filled. They will descend in a rescue capsule, 1.05 meters in diameter by 2.5 meters high , designed by the technical director of the Provincial Fire Brigade of Málaga , Julián Moreno , and manufactured by blacksmiths from the Malaga municipality of Alhaurín de la Torre. This capsule, which looks like an elevator, is driven through a precision crane , and has air ducts; in addition to a townhouse to load almost 500 kilos of land. The savior of the miners of Chile: "Have hope"
As soon as he received the information, Rodrigo Reveco knew that they needed him from the other side of El Charco. He had never been to Totalán , province of Málaga , Spain. Nor had I listened until then to talk about little Julen , the two-year-old boy who fell into a pit last Sunday. However, Reveco had seen himself in a situation of similar harshness. This civil engineer and Chilean emergency consultant designed, in 2010, the mechanical cylindrical capsule, which transcended as Fénix capsule , and which allowed to rescue alive the 33 miners who remained trapped in San Jose for 17 days in 2010 . His first impulse was to write to the Embassy of Spain in Santiago de Chile offering his expertise for the rescue of Julen. "We have initiated the pertinent steps to send your valuable proposal to the competent authorities." He did not know more. But when a journalist sent him a tweet that showed the plans of the 'lift' by which the miners rescuers would have to go in search of Julen, he could not help it. The result is that Reveco works hand in hand with the Provincial Fire Brigade of Malaga to advise them in the rescue of the child of Totalán. "We exchanged a couple of ideas and I gave him free access to all the plans," says the engineer in a telephone conversation with EL MUNDO. Reveco insists that the situation is even more complicated than what he himself lived in Chile nine years ago: "The mining world is one and I think the rescue work that has been done is correct and very precise, the idea forces It has been proposed is absolutely favorable, "he says, and recalls that there were also delays in San José to find rocks of special hardness, which even broke part of the machinery used: " We also made mistakes . " The delays, he acknowledges, "lower spirits and discourage", but seeks to send a positive message to the rescue team: "Have a lot of patience, control the adrenaline and do your work in consciousness , without thinking about all the people who have over " "Have hope," he emphasizes, "we managed to rescue the miners alive 17 days later." The child's family, which follows the work with hope from the front, is receiving psychological attention by a team of professionals who try to control and regulate their emotions in the face of uncertainty about the rescue and in circumstances that are exceptional. Francisca Ruiz , vice-dean of the School of Psychologists of Eastern Andalusia , explained today to Efe that, since last 13th, two specialists are permanently with the parents of the child and their relatives, and they are rotating among the different classmates. They aim to prevent possible later disorders, such as post-traumatic stress or chronic anxiety crises . The vice-dean has indicated that they are encountering "many peaks" of emotions, following the news coming from the technicians regarding the rescue of Julen, and his job is to "regulate those peaks and that can be the most serene possible to handle the situation. " The difficulties of the terrain have delayed the work that continues "without rest" since last Sunday, the sources have stressed. The speed "is subordinated to the geological materials that we are finding", García Vidal explained. These are very complex rock formations "formed by phyllites and materials with more quartzite composition, that is, we go from hard to harder, and this is the fundamental reason why at certain times the drilling speed is slower and slows down everything ", underlines the representative in Malaga of the Association of Civil Engineers of Andalusia. In addition, the device has concreted the area of ​​the dismount to avoid landslides while continuing the drilling and backhoe loaders that during the last days have covered the surface of the hill of the Crown have begun to retire, once the great work platform has been constructed from the which the tunneling machine operates. It took nine days to get here, dozens of hours without rest and hundreds of people who have formed a multidisciplinary team to work indefatigably since the past day 13 occurred the unfortunate accident, although the truth is that a work of Civil engineering of such magnitude would take months under normal conditions. The Cerro de la Corona of the Malaga municipality of Totalán has disappeared as it was known after the work of clearing and the movement of thousands of cubic meters of sand . The crane that will lower the metal capsule or rescue lift for Julen has an approximate length of eight meters and will be the machine that will lower this basket through the vertical tunnel with two or three members of the Hungarian Hungarian Rescue Brigade on board. This capsule or ascensort has a diameter of 1.05 meters by 2.5 meters in height and is designed for two people with material to excavate in case of need of rescue, and in addition it will be able to remove up to 500 kilos of materials if necessary.